Editor's Note: This post is authored by Beth Conlon. Beth is a Visiting Assistant Professor at College of Saint Elizabeth. She has a PhD in Clinical Investigation, Biomedical Sciences program, from the Albert Einstein College of Medicine. She is passionate about developing and implementing behavioral-based nutrition education programs to promote chronic disease prevention and management, reduce health disparities, and strengthen evidence-based nutrition practice. As a registered dietitian nutritionist (RDN), I have a large network of crafty colleagues and friends that I follow on social media. Every Halloween, pictures of Banana Ghosts and Clementine/Tangerine Pumpkins fill my feeds. My parenting food philosophy when it comes to young children is to keep things nutritious, simple, and fun. 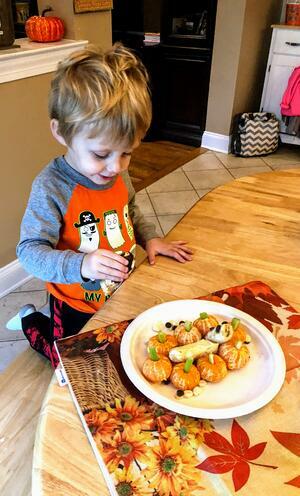 Now that my oldest child is age 3 and has a longer attention span with better listening skills than he did at age 2, I knew this Halloween was the perfect time to try out the ever-popular Banana Ghosts and Clementine/Tangerine Pumpkins. I love this recipe because you can customize it per your child’s food interests and imagination. These can easily be made dairy-free, nut free, gluten-free, etc. with the purchase of the appropriate type of chocolate chips (such as Enjoy Life Foods® brand) and yogurt (such as soy or other dairy alternatives). My son loves chocolate, so my “twist” involved dipping bananas in dark chocolate and accessorizing with white chocolate chips. If you want to avoid excess sugar, bananas can be dipped in plain vanilla yogurt or simply not coated at all. Enjoy the following recipe, inspired by Catherine of weelicious and Katie Morford, MS, RDN of Mom’s Kitchen Handbook with instructions (including modifications), tips, and healthy facts below. 1. Line a baking sheet with wax paper or parchment paper (to prevent the chocolate or yogurt from sticking when cooling). If making banana pops, insert banana halves on popsicle sticks. If coating bananas with chocolate or yogurt follow steps 2 and 3, otherwise skip to step 4. 2. Melt white chocolate or brown chocolate for the banana ghosts in a double boiler or heat resistant glass bowl. Do not overheat chocolate – it should be melted gently – and avoid burning. But do not let cool! It needs to be melted for dipping. Alternatively, put the yogurt into a bowl. 3. Hold onto the base of the banana half or popsicle stick. Roll each banana into the melted chocolate or yogurt to coat. Let excess chocolate or yogurt drip back into the bowl (you can use your fingers to make this easier – and what’s great about this is that it doesn’t have to be perfect because any lines will create a ghostlier effect). 4. Before cooling the coated bananas, while the coating is still soft, insert the pointy side of the chocolate chips into the banana to create ghost eyes and mouth. I used dark chocolate chips for white chocolate or yogurt ghosts, and white chocolate chips for dark chocolate ghosts. If you did not coat the bananas, simply insert the chocolate chips! 5. Lay the coated banana ghosts on the wax paper or parchment paper. Immediately refrigerate until chocolate or yogurt coating is firm, about 1-3 hours. You can freeze for longer storage periods. The uncoated bananas may be refrigerated, frozen, or consumed immediately (avoid leaving at room temperature for too long because they will brown). 6. While bananas are cooling, insert one celery stalk into each peeled tangerine or clementine to make the pumpkins. 7. 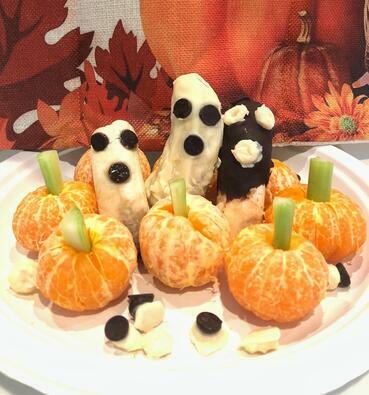 When ready, remove banana ghosts from the refrigerator or freezer (you can trim off any excess chocolate or yogurt). Instead of dipping the banana in melted chocolate, insert chocolate chips into the banana to make the eyes and mouth of a ghost. Simple! Instead of celery for the tangerine/clementine pumpkin stems, you can use pea halves, green beans, or similar vegetables (you can also mix it up and use varied veggies). To prevent/reduce browning of bananas, you can store the bananas in an airtight bag or container. If making them shortly before serving, you can sprinkle with a bit of clementine juice – the vitamin C helps slow the browning process. If you make banana pops by putting the banana halves on popsicle sticks, these can then be readily frozen and enjoyed at any time. See Katie’s recipe for more details. Clementines and tangerines are an excellent source of Vitamin C, making them a great immune-boosting snack for cold and flu season. Bananas are boasted for being a rich source of potassium, an important pre-or post-workout mineral to reduce muscle cramping and maintain hydration. One long stalk of celery only contains 10 calories and has high water content, making this a great snack to satiate crunchy cravings and stay hydrated! 1. McCord C. Tangerine Pumpkins Banana Ghosts. Weelicious. 2. Morford K. BooNana Ghost Pops. Mom’s Kitchen Handbook. 3. National Nutrient Database for Standard Reference Legacy Release, Agricultural Research Service, United States Department of Agriculture. Food Search: Full Report (All Nutrients): 45363190, Clementine, UPC: 845857020036. USDA Food Composition Databases. 4. National Nutrient Database for Standard Reference Legacy Release, Agricultural Research Service, United States Department of Agriculture. Food Search: Basic Report: 09040, Bananas, raw. USDA Food Composition Databases. 5. National Nutrient Database for Standard Reference Legacy Release, Agricultural Research Service, United States Department of Agriculture. Food Search: Basic Report: 1143, Celery, raw. USDA Food Composition Databases.